The view east from Lammersdorf was beautiful to the eye, rolling hedge-rowed fields broken by an occasional farmhouse, ravines and steep pine hills. But it was ugly ground for offensive fighting. The wooded hill-crests made natural strong--points for the enemy and gave them observation over all the natural or easy routes of attack. Those routes that remained were difficult, involved working through heavy brush and climbing steep and muddy heights. In addition the, enemy had adjusted in on every possible target, thoroughly mined the roads and trails, and chosen its defensive positions with great care and wisdom. The 310th mission was, to advance across this terrain, capture the town of Rollesbroich, the high ground north, of Rollesbroich, and a road junction and commanding ground south of Rollesbroich. The early morning of December 13 was extremely cold and the snow 'which had fallen intermittently for three days was in places waist deep. Already thoroughly wet, the troops had spent a miserable night preparing for the attack, trying to keep warm, and wondering what the real thing would be like and how well they would fight. At 0400 the men of the Third Battalion moved forward, worked their way up a nearly vertical 2010 foot slope and passed through the 102nd Cavalry which had been holding the line. Meanwhile, to the north, the 311th Infantry and the 78th Reconnaissance Troop were firing everything they had, in order to deceive the enemy as to the' 310th's direction of attack. The Third Battalion, commanded by Lt. Col. Harry Lutz, attacked at 0600. Co K on the north, Co L on the south, Co I in reserve. Struggling over slippery terrain in intense darkness, stumbling into foxholes, scratched by branches, the men advanced undiscovered by the enemy until 0625, when, both companies received their first fire. Co L men quickly learned the noiseless approach of the mortar shell and the sound of rapid-fire German automatic weapons, while, Co K saw its first Kraut soldiers, who fired at them until out of ammunition and then surrendered. The companies continued to advance and at 0730 seized their initial objectives, small hills overlooking Rollesbroich from the north-west and south-west. At this point the enemy showed its strength. Machine-gun fire from a concrete troop shelter atop a steep hill north of Rollesbroich pinned down most of Co K while heavy artillery and mortar fire fell in its midst. There was no need for instructions to dig in. The men dug quickly and automatically' as they had hit the ground when the first shells fell. But a few elements of the company managed to work their way south and were able to enter Rollesbroich. Co L too, ran into a tough obstacle. The company was astride a hill just west of the crossroads at the southern end of Rollesbroich when it received intense machine-gun fire from one of the crossroad houses. One platoon was pinned down. When it became apparent, from the ineffectualness of L Co's return fire, that this was no ordinary house they were facing, the still mobile platoons bypassed the crossroads to the north and entered Rollesbroich. By noon, with the assistance of those Co K elements which had entered the town, they had cleared most of Rollesbroich's 50-odd battered buildings. The resistance was primarily from snipers with burp guns who fired until their ammunition was exhausted and then came out shouting "Kamerad" Co's K and L had taken Rollesbroich and were mopping up, but the crossroads-house, which was in reality a disguised troop shelter with thick concrete walls, was still a problem. Two men made a gallant attempt to destroy it by creeping to its very walls and placing charges against them. However, the long trek and constant falling in the snow had thoroughly wet the charges and they failed to explode. An artillery concentration might have been affective, but Capt. Barton H. Hunter, Co L commander, refused to chance injuring further the wounded-men lying near the fort. Tank Destroyers were unable to approach, because the road, which had already been dubbed "88" Lane, was heavily mined and covered by artillery, mortar and automatic weapons fire which prevented removal of the mines. One platoon of Co I which had the mission of protecting an engineer squad attempting to clear the road had already suffered heavy casualties. Co B attacked at 1345. It -advanced rapidly along the Lammersdorf-Rollesbroich road, "88 Lane" toward the Rollesbroich crossroads from where it expected to turn south to seize the road junction and high ground south of town. But fire from the camouflaged fort which had pinned down the L Co Platoon, and from other crossroads houses, forced the company to dig in after suffering 13 casualties. At 1400, after making personal reconnaissance, Lt. Col. Lutz committed Co I with the mission of swinging around Co K's left flank and securing the hill and troop shelters which were holding up Co K. The newly-committed unit advanced through sporadic resistance, capturing 20 prisoners, to a group of houses just southwest of Co K. There, severe opposition from groups which had infiltrated back to their positions, forced the company to dig in. Meanwhile the elements of Companies L and K which had cleared Rollesbroich dug defensive positions on the eastern outskirts of the town. The Third Battalion, 310th Infantry had gained its primary objective, Rollesbroich. Now the problem was to hold it. There were enemy to the front, to the right and left and even to the rear. Men had to be fed and re-supplied with ammunition, casualties had to be evacuated. This seemed an almost impossible task in view of the fact that no vehicles could enter Rollesbroich because of the mined roads and artillery bombardment. This meant that all supplies and casualties would have to be carried by hand for distances, ranging up to two miles and this in darkness over extremely tough and difficult terrain. But the impossible was accomplished. All available men pitched in regardless of rank or of position. Lt. Col. Lutz personally led and worked with several of the carrying parties. After dark the garrison of the crossroads fort picked up our casualties and gave them first aid. Three uninjured men Pfcs Biggs, Warren W. Hartwell and, Sandford Brooks, who were pinned down near them were also taken. But later that night when six of the Krauts attempted to take these men to the rear they were intercepted by Pfc Crighe Vandergrift and Pfc Carey F. Everitt who with their BAR lay concealed in a dump of bushes. Vandergrift signaled to Biggs, Hartwell and Brooks to duck and opened fire, killing two of the Germans and causing the rest to surrender. All Rollesbroich was cleared except the southern tip, and the battalion was engaged in holding the town, evacuating casualties and re-supplying, ammunition. The enemy garrison abandoned the troop shelter during the night leaving behind the I Co L wounded who had spent much of the night trying to convince the Germans to surrender. The enlisted men had been willing but their officer refused. Companies K and L mopped up in the northern part of Rollesbroich. Company I mopped up north of Rollesbroich and after dark, one platoon led by Lt. Maghran secured the high ground and troop shelter which had given Co K so much trouble. , Anti-tank Co., under cover of darkness, sent two platoons into Rollesbroich to give support if needed. The Medical Aid men and Litter bearers. continued to work without appreciable rest, treating casualties under fire without thought of their own safety, entering and carrying wounded from mine fields and hand-carrying litter cases across thousands of yards of the roughest kind. of ground. The 3rd Battalion had decisively won its first engagement, gained approximately a mile into the Siegfried Line and had killed or captured more than 150 of the enemy. The following day, December 15, the units cleaned out snipers who had infiltrated the lines during the night, improved communications and consolidated positions. Capt. Owens, K Company Commander, personally led a combat patrol composed of part of the first platoon and the light machine-gun section whose mission was to capture a group of buildings located north of Rollesbroich and between the north end of the village and the bald hill which I Company had captured and out-posted the night before. After a terrific fight, they captured an enemy command post and a 75 mm gun position. Pfc Chilgion was killed in this action and Lts. Baskett and Maloney the two fighting buddies of Company K were both seriously wounded. Co I made contact with the 78th Recon. Troop on the left and set up an OP to maintain contact. One platoon of Co 310th Infantry Regiment returned to the minefield which had inflicted so many casualties upon it and, with an A-T Co mine squad and a squad of Engineers, cleared a path through it. The platoon passed through the opening, contacted Co I and then returned with the rest of the company to Ist Bn control. That night it was learned that, several miles to the south massed armored divisions under Field Marshal Von Rundstedt had smashed through the American front line on a broad front and were racing into Belgium. The days that followed were tense and uneasy ones. Not more than five miles to the south Von Rundstedt's armor had already penetrated deeply into American lines. However by 25 January 1945 the Ardennes Bulge no longer existed and American troops had fought their way back to their original lines. It was time to get moving again. During the attack on Konzen on 30 January 1945 a German officer captured by the Third Battalion described the attack as the most excellent and tactically sound he had ever witnessed. Co. I, supported by one platoon of Tank Destroyers, jumped off at 0530, while Cannon Co., working their 105's at better than 5 rounds a minute, fired a 10 minute concentration of 320 rounds into Konzen. The high ground east of Konzen (Konzen Hill) fell without resistance and Co I moved toward Konzen from the east. Co L with a platoon of tanks in support moved forward at 0800 and entered the town from the northeast. Resistance was light at first and the troops advanced rapidly through the shell-shattered village whose only remnant of former inhabitants were the horse, and cow carcasses which lined the roads. At the center of town however, two platoons and the headquarters group were held up by heavy rifle and machine fire from a large stone house. Several direct bazooka hits set afire the lead supporting tank which had approached to within a hundred yards of the house. T/5 Henry C. Ficht, Co L aid-man, immediately rushed across the fire-raked field in front of the house, climbed the flaming tank turret, and was attempting to extricate the wounded tankers when he was killed by Burp gun fire. Ficht, was wearing a white snow suit with a large red cross painted on it as well as, the red crosses on his helmet. Seeing this Pfc, Richard L Lussier, who was returning to his platoon, after having successfully carried under fire an important message to .the Company Commander, rushed directly toward the house. Surprised by the suddenness and daring of his attack 14 of the enemy surrendered when he entered the building, and the remaining 15 who were in the cellar, were taken by four Co L men who assaulted the house immediately behind Lussier. The company also overcame determined resistance from a factory at the northwestern end of town and contacted Co I at 1300. During the afternoon Co L mopped up in the outskirts and at dark dug in on the southern tip. A total of 62 enemy were captured by the battalion whose total casualties for the operation were 10 wounded and two killed. On 31 January Company K was attached to the 311th Infantry Regiment and moved to Kesternich to assist the 3rd'Battalion of the 311th Infantry Regiment in holding the town. K Company cleaned out the eastern end of Kesternich, defended it, but suffered heavy casualties in the action. The remainder of the battalion closed into billets in Simmerath at 0200 1 February and remained there until the morning of 5 February. The Third Battalion attacked Steckenborn on the morning of 5 February under the temporary command of Combat Command R of the 7th Armored division. Company K was relieved the same morning and moved back to, Simmerath where it remained throughout the, Steckenborn action. Attached to the battalion for the attack on Steckenborn was a company of tanks and a platoon of tank destroyers. The general plan called for Part of Combat Command R to seize the town of Steckenborn, while the other part seized Strauch. At. 0630 Company L took up positions, prepared to fire on Strauch with MG's'and 60's. Due to the poor visibility Company L was unable to fire on Strauch and dug in to await orders to advance.' Both Company I and Company L were prepared to advance on Steckenborn on order of the CO of CCR. Company I was on the right t and Company. L on the left of the battalion sector. The 18th Field Artillery fired 4000 rounds of rocket tubes into. Steckenborn which it was later discovered completely terrified the Germans. At 0800-the Commanding Officer of Combat Command R ordered. the task force to begin its advance from the vicinity of Kesternich. At the same time Company L began its advance. At 0345 two platoons of tanks moved out from their line of departure at Kesternich leaving one platoon in reserve in the vicinity of Kesternich. Two tank destroyers were also assigned to each of the two infantry companies. Company I moved from its line of departure 200 yards south of Steckenborn at 1015. The company reached the edge of town at 1030 without encountering enemy resistance. On the left the task force from Kesternich including Company L had started into the town. At 1040 Company I reported artillery falling on their positions from cast of the Roer River and counter-battery fire was requested by the Battalion Commander on all known positions east of the river. Company L encountered its first enemy resistance soon after entering the town. S/Sgt. Campbell, Co L's 1st platoon, led a successful assault on a pillbox, running at full speed with a beehive charge to blast open the door. S/Sgt. Essex of the 2nd platoon of Company I cleared the roads of mines so a tank, destroyer could be brought up to blast a pillbox. He completed the removal of the mines even though the enemy kept firing at him all the time. S/Sgt. Collins was killed when an "88" hit the building from which he was shooting' at the enemy. Company I was approximately two thirds of the way, through the town in its sector to the right, and reported one casualty in taking its objectives, while Company L reported that it had suffered no casualties at this time. Company I reached the far side of the town and discovered three pillboxes beyond their position. Shaped charges and flame-throwers were requested to be brought up to destroy the pillboxes. However, Engineers were working on the to clear them of mines and two to three feet of snow, and delivery of the flame throwers and shaped charges from the Kesternich Ammunition Supply Point was delayed until late' afternoon. At 11400 the Battalion Commander requested that the two reserve tank destroyers be brought forward to assist in the capture of the pillboxes at 1500. By 1645 Company I reported one man killed and one wounded but had taken the pillboxes with the aid of the TD's. The Company continued to mop up in the northeast part of the town-with the tanks. It was necessary to clean out the three pillboxes since they would leave the Germans in a position to infiltrate back into town that night. At 1745 instructions were received from the Commanding Officer of Combat Command R to consolidate and hold the positions taken, paying particular attention to the north and northeastern positions of the town. During the days operations Company I took 14 prisoners and Company L 41. During the operations on Steckenborn two companies with two platoon of tanks- and one section of tank destroyers had been used. Company L suffered no casualties but Company I had two enlisted men killed and one Officer and 12 Enlisted Men wounded during the day. A "moderate" amount of 'shelling took place during the operation but some casualties were incurred from it as well as from the small arms. Both companies held their positions and were passed through by elements of the 7th Armored Division which moved up to Hechelscheid. Through the slush of a premature thaw, infantrymen of the American First Army closed in again today on the tortuous maze of gulled streams and artificial lakes behind which runs the second zone of the Siegfried Line east of Monschau. One dam, the Urftal-sperre was seized and other units were near another, the Paulushof. There has been a pause, meanwhile, in the main assault on the second zone of the Siegfried pillboxes running through Schleiden and Gemuend east of Monschau. But in the interim the American Seventy-eighth Infantry Division went back into action again today with an advance up to the line of the Roer River northeast of Kesternich. This division is engaged in eliminating a Westwall salient in the Allies' line northwest of Gemuend and in bringing its positions up even with those to the southeast. The Siegfried defenses in this area present an intricate and tricky tactical problem. Roughly speaking the second belt of pillboxes runs behind the line of the Olef, Urft and Roer Rivers which, with their five dams and artificial lakes, form part of the same twisting system of waterways east of Monschau. The rivers often run through 3teep canyons gashed into wooded hills by centuries of erosion and in many places present a formidable obstacle to advancing troops. In the area northeast of Kesternich the Seventy-eighth Division, backed up by tanks, attacked at 3 o'clock this morning and gained up to 3,000 yards, reaching the west bank of the Roer River near Ruhrberg. Its lodgment along the river extended northward and two towns, Strauch and Steckenborn, in the Siegfried defense system, were cleaned out. As the infantrymen pushed on farther north to the outskirts of Hechelscheid and Woffelsbach, they met stiffened resistance from rifles, artillery and pillboxes. In a sector immediately north of this advance, the second zone of the Siegfried Line has been outflanked for some months by a penetration east of Aachen and American forces are within three miles of the largest and most northerly of rear dams at Hasenfeld, southeast of Schmidt. The Seventy-eighth Division advance brought its artillery to high ground overlooking the Paulushof Dam on the Roer, while to the south the Forty-seventh Regiment of the Ninth Infantry Division captured the Urftalsperre Dam in the Urft River northwest of Gemuend and sent patrols across its top which has been cratered by bombs or shells. Southwest of Gemuend other elements of the division advanced 1,000 yards toward the Siegfried defenses. Farther south the Second Infantry Division captured Hellenthal, three miles southwest of Schleiden, but a battalion of German troops broke back into the town today and at last reports were still fighting for its possession. The attack on the Westwall continued today without any vestige of air support. The battalion moved from Steckenborn into an assembly area among several blown up pillboxes north of Strauch just before dark on the 6th of February. Having fought all day and into the night the day before, the men had little trouble falling asleep after a good hot meal brought up by the, faithful kitchen crews. The night was wet and cold, but the men managed to get a little sleep in their foxholes which they lined with straw to keep from lying in the mud. During the night the battalion received orders to attack astride the road toward Schmidt, passing through the 1st and 2nd battalions whose exact location in the woods was not known, but who had been reported to have reached a well prepared road block that consisted of a steel gate backed up by a huge crater which covered the whole width of the road. The battalion was to attack east just before daylight and capture the fortifications and wooded areas at the base of the high ground which overlooked the fortified town of Schmidt. Through the thickest minefields American infantry picked a path today to within less than three miles of the biggest of five dams in the reservoir system controlling the level of the Roer River, along which American forces have been standing since December awaiting an opportunity to cross into the Cologne plain. Blasting of the dams by the Germans might flood the Roer valley and render the river almost impassable. While units to the north worked their way slowly through rugged woodlands around the reservoir system, forces farther south ran into stiffer opposition as they fought to pry open holes in the Siegfried Line in the Gemuend-Schleiden and Pruem sectors. The Germans brought up tanks and self-propelled field guns to back up their infantry in Siegfried Line outposts in front of Schleiden. And they threw in counter-charges west of Pruem. The 311th Infantry was to attack from the south on the right of the 3rd Battalion to seize the high ground overlooking Schmidt and the capture Schmidt itself. The plan of attack was as follows, Company K was to lead the attack, attacking astride the road and capture the pillboxes located all along the road at the front of the hill overlooking Schmidt. L Company echeloned to the left rear was to clean out the woods north of the road and protect the battalion left flank: I Company echeloned to the right rear was to clear out the woods south of the road and protect the right flank. Co A of the 774th Tank Battalion and two platoons of Co B 893rd Tank Destroyer Battalion were attached to the battalion for the operation. One platoon of tanks and tank destroyers were to attack the pillboxes with the leading elements of Co. K. Moving through the area, which was once a German Military encampment but now a mass of shattered buildings, K Co with the 3rd platoon leading started the attack astride the road. The woods on either side of the road were studded with pillboxes, and the first light of day revealed the bodies of wounded and dead from the previous days fighting. The woods, once thickly planted pine groves, were now a mass of splintered poles, the ground covered by shattered limbs and whole parts of trees. As the men moved on they came upon a pillbox which was converted into a hospital during the night before by an English speaking German Army doctor who was caring for more than a score of both wounded enemy and American soldiers. A few yards further down the road was the cratered road block. Lt. Blackburn and his engineer platoon cleared a path to the right of the road for the tanks, which a few minutes later caught up with the riflemen, who had just made a welcome contact at (Gelensberg?) (*), with the remnants of G Company who had been out of contact with their battalion throughout the long night before. First enemy fire was drawn when the men moved east from (Gelensburg?) (*). The 3rd Platoon aggressively outflanked an enemy group defending a pillbox on the left of the road and in a few minutes 13 enemy with their hands locked behind their heads were marching to the rear. About this time the Kraut artillery fire started coming in. The leading tanks deployed off to the left of the road to join the fight, but were halted when they came upon a minefield. Capt. Owens had already dispatched Pfc Norwood back to the roadblock where the engineers were working and as a result work was begun to clear a path just about the time when the tanks were halted. Pvt. Falk of the Engineer squad, dissatisfied with the progress of the work put himself in charge and the men inspired by his example began pulling mines out of the ground like mad. Artillery shells were whistling in but the men kept right on working. Only one mine was left and the path would be clear. Someone remembered at this time that they were taught to, pull mines with a long rope because the Germans sometimes booby trapped them so they used a rope on this last one. As they yanked the rope there was a terrific explosion no one was scratched, the rope had saved their life. Pvt. Falk was wounded a few minutes later while he was removing mines from the road because he was too busy to duck when a Kraut shell whistled in. The attack moved swiftly when the tanks came up only one more pillbox and the right half of the battalion objective would be secured, A few rounds from the tanks and a rush by the 3rd platoon took this one. The platoon with the tanks' inspired by their own success did not stop and went on toward Schmidt capturing pillbox after pillbox. Capt. Hope, Bn S 3, was riding in the lead tank in order to co-ordinate their efforts with those of the 3rd Platoon. He was wounded while leaning out of his tank going over plans with Lt. Friedberg, 3rd platoon leader, when a terrific artillery concentration fell on their position. Sgt. Jack Rogers, noted for his exploits with his grenade launcher was wounded at the same time along with several others. T/Sgt. Daniels, Plt. Sgt. of the 3rd Platoon, who began the attack at the rear of his platoon was now leading the assault along with Lt. Applegate, Mortar Observer. T/Sgt. Sahlin led the 3rd platoon around to the left recapturing Capt. Murphy, Co G, who was captured the night before, but who in the meantime had talked the bewildered Kraut soldiers into surrendering. Prisoners were swarming in droves to the rear as the 1st platoon pulled up abreast of the third platoon. When the Company halted to reorganize they were sitting on the high ground overlooking Schmidt six hundred yards away. They had captured what was to have been the initial objective of the 311th Infantry. 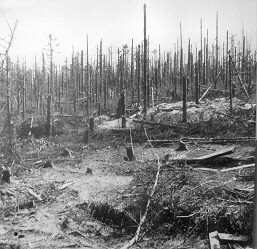 L Company moving through the woods on the left suffered many casualties from one of the heaviest enemy artillery concentrations ever witnessed. Among, the wounded was Lt. Schenck, the fearless leader of the 3rd Platoon. The Company captured a number of pillboxes in the woods taking the confused Germans by surprise and moved abreast of K Co on the left and occupying the high ground overlooking Kommerscheidt. Co I cleared the woods south of the road and to the right of K Co. They too came under terrific artillery fire, but were more fortunate than Co L. Lt. Fields, the popular section leader of Co M, Mortar Observer with Co I, was killed when a Kraut mortar shell fell beside him. The battalion halted on order and was passed through in the late afternoon by the 3rd Battalion, 311th Infantry whose objective was Schmidt. The Battalion C. P. was established in the first pillbox captured by K Co's 3rd platoon. It served as Regimental C. P. and was visited by General Parker, Division Commander, and General Collins the Corps Commander the following day when the battalion was fighting for Schmidt. Casualties for the days operations were 4 killed and 38 wounded. The night was cold and wet just like the night before and the men hardly slept at all. Orders were received during the night that the 310th Infantry with 3rd Battalion leading would clear the road from Schmidt to Heimbach, seizing the high ground over the Roer River, thereby cutting off the troops in the vicinity of the dam. It was reported that Schmidt had been captured and that the 3rd Battalion would pass through the 311th Infantry and start the attack some where east of Schmidt. The battalion moved out at 0530 and a few minutes later were met by Major Kennedy who commanded the 1st Battalion, 311th Infantry at the western entrance of the town. He reported that friendly troops of the 3rd Battalion 311th Infantry were dug in a hundred yards ahead and that the enemy was still holding out in the town. This information proved to be correct because the third platoon of I Company drew fire from houses on three sides at daylight as they started moving into the town. Lt. Kelley, 3rd platoon leader rose firing his "Grease Gun" in an effort to rally his men forward, but he was quickly cut down with a few others who followed his example. Lt. Perrin who brought the tanks and TD's up to join the attack of the 3rd platoon tried to point out the houses where the fire was coming from to a tank commander but each time he crawled up on the tank a sniper would try to pick him off. The first platoon of Co I was thrown in on the north flank of the third platoon while the 2nd platoon worked along the south flank to reduce the resistance on the flanks of the third platoon. With the three platoons abreast the Company began a slow, but steady advance through the town. The Germans defended practically every house and stubbornly fell back to help defend succeeding houses. Many dead enemy were found in the houses and the moaning of the enemy wounded could be heard interspersed with the firing. The first platoon working with the' light machine-gun section on the north side of the town was under continual enemy machine-gun fire. I coming from Harscheidt, the village northeast of Schmidt which supposedly h taken by American troops but apparently now had not. Using the piles of rubble for protection against this fire the men kept right on fighting the enemy in Schmidt. Private Norman A. Funk, leading scout of his platoon distinguished himself by aggressively leading his platoon from house to house blazing away with his M-1 and pitching grenades, into windows and doorways, but his luck didn't last and he paid, the supreme price. Sergeant Erickson was killed with a hand grenade while leading his squad through the piles of rubble. T/Sgt. Carlson along with Sgt. Simmons squad, shooting out of windows in a house they had just entered had a field day shooting Krauts, at a range of one hundred yards. They picked them off one by one as they tried to escape to the shelter of a pillbox from a house which was under attack. Seventeen bodies were counted later along the path that they ran for shelter. Finally at 1430 after fighting their way through the many pillboxes and fortified houses and piles of rubble, the men reached the eastern end of the town. 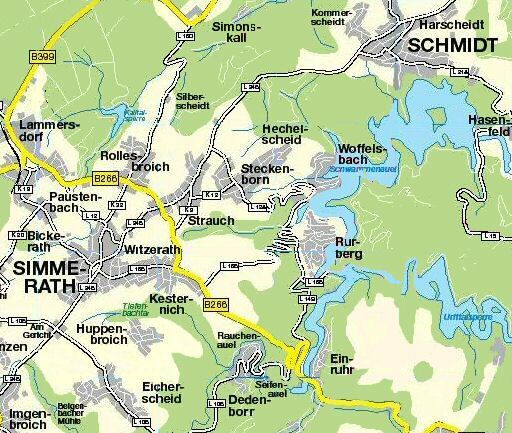 Schmidt, the key to the defenses of the Schwammanual Dam, was now captured and the remainder of the battalion moved forward through the town to gain its mission, that of clearing the road, Heimbach, and capturing the high ground one overlooking the Roer River. When the medical section of the 3rd Battalion moved into Schmidt it was necessary to establish the aid station in a cellar. Evacuation there was a problem since the troops were exposed-and had to be evacuated by Weasel. Capt. Colwell made the rounds like a regular country doctor, visiting each company under enemy observation. Pfc. Charles T. Kelley found two ambulances at a Nazi aid station at Schmidt. One these: he got running and evacuated, many with it. Lt. Janes, the Battalion S 2, observing from the upper story of a house in Schmidt a few moments after its capture, located several enemy machine gun positions astride the road on the high ground in the vicinity of Neuenhof about 2000 yards east of Schmidt. With this information a coordinated attack was planned for 1600 with Co L advancing east from Schmidt, attacking astride the road to capture the high ground in the vicinity of Scheidbaum about 1500 yards east of Schmidt. K Co was to take a covered route through the woods to the right of L Co and capture the wooded knoll southeast of Scheidbaum and then envelope the enemy positions in the vicinity of Neuenhof. Plans for artillery and mortar fire to be delivered on the enemy positions located by Lt. Janes were made. At 1530 elements of the 2nd Battalion 311th Infantry were seen advancing east in K Co's zone of attack. This called for a change in plans which resulted in L Company attacking alone with K Co to follow in column. At 1545 word was received that the artillery would not fire because friendly troops of the 311th Infantry were located in the area. This was found later to be incorrect, but Company L jumped off at 1600 without artillery support. Two platoons of tanks started with the attack but after advancing about five hundred yards, three tanks were hit by fire from a group of five enemy tanks located on the road between Scheidbaum and Neuenhof. That ended the tank support for L Company. The 1st and 3rd platoons personally led by Lt.'s Barzeley and Ober continued the attack in spite of withering machine gun fire. With a handful of men they reached the few buildings which comprised the settlement of Scheidbaum where they came under fire from the five enemy tanks, which a few minutes ago had knocked out their friendly tanks. Pfc. Garcia with Pfc. Lussier assisting fired a few bazooka rounds at the leading tank, setting it on fire from the upper story of one of the houses. A few seconds after they clambered down the steps with one precious bazooka round left, the house collapsed from a barrage fired by the tanks. At this time men from the First Battalion coming up on the left with marching fire were a most welcome sight. It was almost dark now, the enemy tanks and machine guns were still blazing away, and no artillery fire on them could be obtained because of faulty information of friendly troops being located there. The men dug in when darkness set in. During the night word was received that the 60th Infantry of the 9th Division would pass through our lines east of Schmidt prior to daylight in the morning and proceed down the road to Heimbach. Hot chow and ammunition were brought up during the night and plans were made resuming the attack the following morning on the left flank of the 60th Infantry to secure the high ground overlooking the Roer River at Abenden and Blens thereby securing the left flank of the 9th Division. At 0700 the 60th Infantry passed through L Companies positions and were stopped by machine gun fire from the positions which held up Co. L the night before, but the enemy tanks had pulled out during the night. At 1000 men from Co C. 310th Infantry outflanked these positions from the north allowing the 60th Infantry to advance. In the meantime the battalion with Co K leading was pushing out to the northeast entering the woods north and east of Scheidbaum. The woods was filled with fanatical enemy who had just destroyed their own artillery pieces and had taken up firing positions in dugouts manning machine guns and rifles. The fire was deadly accurate and took a heavy toll in lives. Within a five minute period, Sgt. Sielski and Pvts. Siemon, Carlberg, and Pickering fell mortally wounded. Privates Benreiff, Pasquale, Bennett and Fisher also of K Co died in this action. Lt. Saunders, Co K's fighting executive officer arrived in a nick of time with the third platoon and two tanks which had become separated from the company as a result of the intermingling, of units of the 1st Bn 310th and the 60th Infantry with those of the 3rd Battalion. The tanks zigzagging their way through the trees with the 3rd platoon close at hand soon broke up the fanatical enemy defenders, many of whom fought to their death. K Company reached its final objective and shortly after noon the men were looking down at the river below and were viewing the destroyed bridges over the river at Blens and Abenden. L Company with Lt. Ober in Command as a result of Capt. Hunter being wounded and evacuated in the morning, pulled up on K Companies left overlooking the town of Blens. The woods which K Co had fought through was littered with enemy dead, but among the enemy dead there lay the bodies of several men of the 3rd Battalion. In addition to K Co's dead there was Lt. Mullins and Pvt. Robabowski of Co L who were ambushed while reconnoitering their position. Through the tireless efforts of Major Pierce, the A & P Platoon and the Anti-Tank Platoon, a road was built through mine fields and mud holes and with the aid of Company carrying parties the men got a little hot food the first night. By noon of the following day, Pfc. Dragon drove his weasel loaded with hot chow and ammunition to the company positions, some of which were difficult to reach even on foot. Nobody slept at all the first night on account of the rain and the fact that holes had to be dug. By dark of the second night, bedrolls had been brought up and the men had covers constructed over their holes to protect them from, the weather and from the deadly enemy artillery. Under cover of darkness on the night of February 12, the first and second platoons of Co L preceded by a patrol led by Sergeant Pologi slipped into Blens and occupied the town without firing a shot. The few enemy who were left in the village were captured by surprise the following morning. The occupation of this town remained unknown to the enemy. The one rifle platoon from Co L and the machine gun platoon of Company M which comprised the occupying force was fed and supplied by carrying parties at night. They supplemented their rations by milking a cow every night, which they had found in a barn. However one night Lt. Nolph and Sgt. Pologi, who never bothered to be scared by the enemy, got a big scare when they tried to milk a bull in the darkness. From their positions in Blens the men would call down artillery and mortar fire on enemy positions just across the river a few hundred yards away. On the morning of February 14, Company L's Command Post was subjected to the most deadly and accurate mortar concentration ever encountered, causing over twenty casualties. Lt. Saunders, who had just taken command of L Company when Lt. Ober left the Company to take command of Company B in the first battalion, was mortally wounded. Also mortally, wounded were Corporal De Loach the courageous communications sergeant, and Pvts. Buchmann, Rosenbaum, Torres and Tester. The remainder of the month of February was spent in recuperating from the fighting which carried the battalion from Konzen to the Roer River and in training for the fighting to come. The men worked on small unit problems, bayonet training, and firing of the BAR, Bazooka, and rifle grenades. During this period two patrols from Co I, both led by S/Sgt. Field crossed the Roer River to capture a prisoner for the Division G 2. On their first try they ran into too many of the enemy and had to shoot their way out killing a number of the enemy in doing so. On their second attempt, they came back empty handed because the enemy had taken off into the hills. Lt. Perrin, Bn S 3, Sgt. Sloop, second platoon of K Company and Pfc. Wheeler crossed the river at dusk in an assault boat to reconnoiter and clear a path trough an enemy anti-personnel minefield. In the vicinity of "'Blue". The patrol removed home made box mines which were brought back to the 3rd Bn for training purposes. The "Blue" Battalion "Blue" being the code word used for the 3rd Bn of Infantry Regiments, had not only tasted combat but had taken several good swallows. They were seasoned combat Infantrymen now and in their hearts was love, admiration and respect for their fellowmen, their officers and an undivided loyalty to their duty. Gelensberg or Gelensburg is unknown to me. Most probably the text is refering to GERSTENHOF, situated west of Schmidt along the Strauch - Schmidt road. Excerpt: Seventy-Eighth "Lightning" Division. n.p., 1946. 101 p. #603-310.1946. U.S. Army. 310th Inf Regt.